After weeks splitting large boxes of print into 200 bundles from 1.9 million pieces of print, packing into 10 internal boxes per kit, including 3 with the new Yes flag design, plus Voter Registration Forms, 200,000 stickers, 10,000 window stickers 5,000 labels and packing these into a custom box there was something else that needed to be done. It was a bright sunny morning with unusual warmth for mid-November and a sharp contrast to the previous day when the lavender in two planters outside a local retailer were visibly shivering in the smir and breeze. Such is our variable climate, not unlike the daily changes in the wretched progress of Brexit. So to share the content with those who have not seen what is in the Indy kits, now that the pre-orders have been despatched, I decided to unpack a set and take a photograph to share with Newsnet readers and others on social media. Taking one of the many pallets that bulk deliveries arrived on was also an opportunity to stand back and see what so many had contributed to as the pallet was gradually covered, revealing the goodies packed in the big box. To explain, ayeMail is run by son, Lindsay Bruce, but this gigantic exercise needed extra hands so everybody got roped in. Newsnet articles have been less frequent in the last few weeks as a consequence. Two of the pieces of print are Newsnet research plus a collaboration on the currency flyer. That has been Newsnet’s small contribution. The main print graphics have been contributed by Colin Dunn, Ellen Joëlle Hõfer-Franz of EU Citizens for an Independent Scotland and Lindsay Bruce. Countless others have contributed with advice and support plus the many who contributed to the fundraiser, adding to the funding from the Scottish Independence Foundation. When everybody comes together the Independence movement can deliver real support for those on the ground. I have been privileged to see this come to reality from something as simple as an idea to put materials in the hands of the movement to bring independence closer. It has been six months in the making with hours and weeks of planning, consultations, endless complex calculations, spreadsheets and yet more spreadsheets. To handle this immense quantity and weight, specialist equipment was sourced to aid handling and a custom made jig constructed to deal with box banding. A lot of creativity went into the handling from roller conveyers to a clever piece of lifting equipment. Much has been learned in the process but one thing is certain: it would almost certainly not be possible to produce ayeMail Indy Kit Mk 2 at the incredibly low price of £54.00 to groups registered with the National Yes Registry. If your group has not yet registered with the National Yes Registry, or you have not got round to ordering – then now it the time. 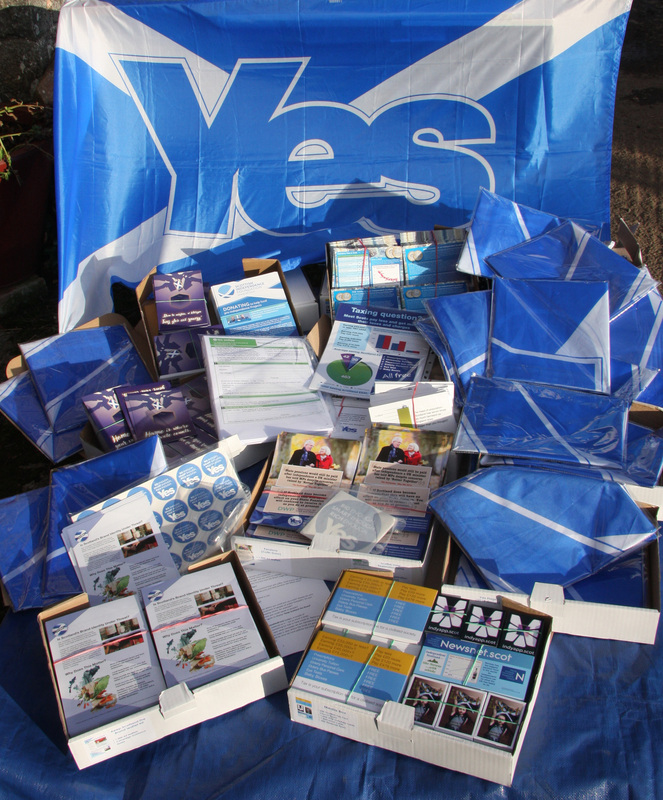 Over half have gone through pre-orders and a bulk delivery to Glasgow and West Yes regional group. And a reminder. The kit weights 37 kilos so when the carrier drops it off, leave it there, cut the banding carefully with a scissors on the side and unpack the individual 10 boxes inside. Make sure you have yours before everything moves into Christmas mode. Selling the flags will raise money for your group. With the Brexit shambles finally coming to some, as yet unclear conclusion, we have all the means and motive to ensure we are now building support for independence with those previously unconvinced. The date will come soon, but it is the preparation and steady campaigning in the meantime that will actually deliver an independent Scotland. Previous articleWhen Will the War Be By?